Best Solar Oven: The SunCook ? The SunCook Solar Oven is probably the best built, sturdiest and tightest solar oven on the market. It is obvious just from looking at it that it was built with the best precision manufacturing techniques and the highest quality materials with the goal in mind of producing a long lasting, rugged and very efficient solar cooker. The SunCook is Europe's answer to the well known Global Sun Oven that has been in production here in the US for around thirty years now. The SunCook is not a total newcomer to the US market though, it has been sold and used in Europe and other countries for several years now and has done quite well for itself. 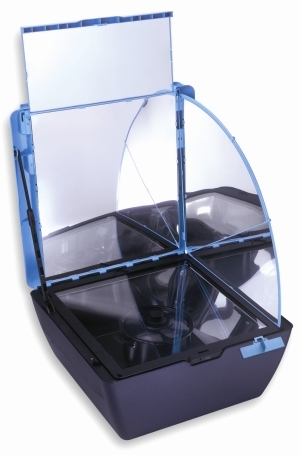 We at Solar Cooker at Cantinawest wanted to also offer to our customers a high quality, "higher end" solar oven along with our other lines of quality solar cookers and accessories. I felt it was necessary to give my opinions of the SunCook Solar Oven; the things that I like and also the things I don't care for about the SunCook, just as I have done with our other solar cookers offered here on our site. I like the very sturdy, tough exterior, or rather the outer shell or casing of the SunCook. It is made of a thick UV resistant Aircraft grade Plastic allowing it to stand up to much rigorous use and movement and will not fade or crack from exposure in the sun. This cooker is also compact enough when completely closed into its stored position. I like how well sealed the cooking chamber is through the use and means of a double pane tempered glass lid, or door. It is very similar in looks and design to the Tulsi Hybrid Solar Oven lid, but this one seems to be sturdier. It retains heat very well. If taken care of it should allow for many years of use. I like the two adjustable, locking arms on the reflector panels that make it very easy to adjust the panel angles and then to lock them into position as well as to unlock them. They are very easy to use and seem quite sturdy. And I like the main reflector panel extension that allows for more surface area for capturing the sun's rays. Also it has a detachable side reflector panel that can telescope out to wider widths when attached to the main lid/reflector panel. The side reflector panel gives the solar oven added reflective surface which helps increase the heating ability of the oven. The interior oven walls also have reflector panels that help concentrate even more of the suns rays towards the dark cookware. The manufacturer describes this feature as:acting as compound parabolic concentrator greatly reducing the need for regular re-orientation. These concentrate all incoming solar radiation to the bottom absorbing plate,which in turn radiates heat allowing for a very homogeneous temperature to be attained. I especially like the fact that this solar oven not only has a wide interior but that it is deep enough as well, allowing for the ability to bake regular sized loaves of bread as well as whole sized chickens and roasts. It is wide enough to cook a 14 inch pizza inside in its 16"x14" oven floor. It easily allows the use of any standard or larger size cake, lasagna, casserole and pizza pans/plates with room to spare. The oven depth is 7.5 inches which will easily accommodate any bread baking one would wish to do. The Sun Cook can reach temperatures of 400 F. and is one of the hotter solar cookers on the market. Of course the more food (mass) that you place in a solar cooker the more you have to allow for compensating factors. It will take a little longer to cook and you will have to allow for an initial drop in temperature when you first place food in the oven, but it will gradually work its way up to higher temperatures. The Sun Cook can be used as a thermal cooker (Haybox Cooker) - if it's dark or raining you can still cook! Use your conventional stove to bring your pot to the boil. Then wrap it in a towel and put it into the Sun Cook with the lid closed. The insulation in the oven is so good that the food will remain hot and continue to cook for several hours. Perfect for slow cook, or crock-pot style foods like brown rice, whole oats, chickpeas or lentils, vegetables or soups. This cooker is definitely built to last and to give many years of use no matter what the conditions. It is a cooker of highest quality European grade and manufacture and meets European and US standards for safety and food cooking standards. * * Would these points make the SunCook solar oven the best solar cooker on the market? Some things I do not care for as much about the SunCook Solar Oven. The SunCook is one of the heaviest solar cookers on the market making it more of a challenge to move for people who cannot lift much weight. Of course this can be a plus because it also makes it one of the most wind resistant and steadiest cookers on the market. The SunCook is very airtight so it does not allow for much venting of steam build up inside of the oven. The cooker has a side detachable reflector panel of plastic and aluminum that becomes a bit "soft" when it is in the sun, which causes it to not telescope as evenly and smoothly as it should when raising or opening the cooker lid. The upper extendable reflector panel that slides in and out of the main cover/top panel of the solar cooker does not always stay extended. It can slide of of its latching mechanism and rolls right back into the lid. This may be due to the loosening of the narrow slot into which the extended reflector slides in. Like many new solar cookers/ovens, there is an odor or smell that initially can be detected when first putting the cooker into use and this is due to the new manufacture/factory smell that can accompany recently manufactured products. (Common with the Global Sun Oven, SOS Sport, Tulsi Hybrid etc.) This is easily remedied by initially boiling some pots of water and vinegar or pure vanilla extract inside of the solar oven, and then using a rag, wiping down the interior of the cooker. The SunCook did take a little bit longer to eliminate this smell than some of the other commercial cookers, but less time than it did so for the Tulsi. The design of the SunCook uses a movable main reflector panel for up and down focusing to concentrate the suns rays into the oven, this design is very common around the world in many solar cookers, but I find that it requires a bit more frequent necessity of adjustment to maintain the proper focus as compared to the open flared panel design. And the SunCook is one of the more expensive solar oven/cookers on the market because of the technology, design, machining, materials and manufacture location. But for many people having the finest quality product is a must.